Toronto – March 19, 2014 – UFCW Canada is calling on activists to boycott purchasing aluminum cans manufactured by Crown Holdings in Toronto, in support of USW Local 9176 members forced out on strike by Crown. Since September 2013, Crown has used replacement workers to manufacture cans for its main Canadian customers: Molsons, Coors, Labatt, Budweiser, Creemore, and Steam Whistle. So stand up for the striking workers by boycotting Crown Cans and buying your favourite beer in bottles instead. The boycott does not include cans of Sleeman and aluminum bottles of Coors products manufactured by UFCW Canada members at Ball Packaging. Crown Holdings, Inc. is an incredibly profitable multinational company with more than 140 plants worldwide. Crown provoked a strike at its Toronto beer can factory in September 2013 by demanding massive concessions from the 120 workers. Crown has refused to negotiate a fair settlement with its Toronto employees in the ensuing 18 months, instead recruiting replacement workers to prolong the dispute and try to break the strike. • If your beer comes in a Crown can, buy bottles instead. Check the bar code on the can. 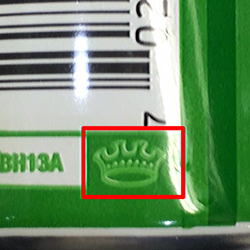 If it has a small, four-pronged crown icon next to it, it’s a Crown can. In addition to the major brewers, Crown also supplies cans to a number of craft brewers, and to Cott Beverages which manufactures private label pop for the major grocery chains.